What could be more terrifying than ascending a rail on a roller coaster? Try riding one that was in service before penicillin was invented. As one of the nation’s greatest amusement park pastimes, the coaster—introduced to the U.S. in 1864 by Coney Island’s LaMarcus Thompson—has evolved from rickety wooden terror trains to high-tech steel diversions. But that doesn’t mean you can’t catch a ride on a classic. Check out these 14 old-school coasters that that are still accepting new passengers. A popular destination among thrill-seeking tourists in New York City, Coney Island’s famous—or infamous—Cyclone debuted in June 1927 and has outlasted its 30-odd peers in the park over the years. When poor city finances nearly saw it torn down in the 1970s, Mayor Ed Koch stepped in to preserve it; it was later named to the New York State Register of Historic Places. But the Cyclone’s 2640 feet of track and Depression-era framework don’t always hold up: The ride has stalled out several times in the past few years, requiring riders to make a dizzying descent from the track on foot. At 92 years young, the Santa Cruz-based Giant Dipper isn’t ready to retire just yet. A standing love letter to the charming economics of the 1920s, the Dipper cost just 15 cents a ride when it debuted in 1924. Builder Arthur Looff said he wanted riders to experience a combination “earthquake, balloon ascension, and aeroplane drop.” Passengers first enter a dark tunnel before being lifted seven stories above ground. Repainting the 327,000 board feet of lumber used in its construction cost $300,000 in 2013, six times what the coaster originally cost to build. A “sister” coaster, also named the Giant Dipper, was erected in San Francisco in 1925. Farmington, Utah’s Lagoon Amusement Park rates its antique coaster’s thrill ride as “very high,” a biased but probably accurate summation: built in 1921, the coaster can hit speeds of 45mph across more than 2500 feet of track, its wooden planks visibly rattling as the train speeds by. Inspectors do a walkthrough nearly every day to replace any worn parts. Located in Bakken park in Denmark, Rutschebanen (Danish for “roller coaster”) is unique among classic amusement rides. Built in 1914, it has a driver—specifically, a “brake man”—who sits in the train and can control the speed manually, creating a unique experience for each set of passengers. Rutschebanen was originally designed to be a simulation trip through the mountains, with artificial peaks seen at the top of the ride. While it might cost you a bit to get to Denmark, you’ll be able to save some money at the park: Admission at Bakken is free. Originally designed and built for Paragon Park near Boston in 1917, the 98-foot-tall Wild One moved to Six Flags America in Maryland. Fans of the coaster are said to be thrilled with “ejector air,” the feeling of being launched from your seat. It’s rumored that the Kennedys took regular rides before it was relocated. Designer John Miller made an important tweak to roller coaster blueprints with the Jack Rabbit in 1920. It was one of the first to use an under-friction wheel approach, which kept the train seated firmly on the tracks as a safety measure. Located in Sea Breeze Amusement Park near Rochester, New York, the Jack Rabbit has a doppelganger at Kennywood in West Mifflin, Pennsylvania with the same name. Located in the same Kennywood Park as the Jack Rabbit, the 1927 Racer takes a (nearly) singular approach to coasters: There are twin passenger trains that launch at the same time, “racing” one another to get to the end of the ride. Curiously, it’s still a single track—just one that’s double-looped for two-lane excitement. If you leave on the right, you’ll return on the left side. While many antique coasters have had to close temporarily for repairs, Melbourne’s Great Scenic Railway claims to be the oldest continually operating ride in the world. Opening in 1912, the Railway was joined by an eclectic group of attractions at Luna Park, including the “world’s fattest boy” (a sturdy 350 lbs. at age 12) and a woman who would set herself on fire before diving into a pool. The 104-year-old ride is accessible via the Aussie Luna Park’s “Mr. Moon” mouth entrance portal. Arnolds Park in Lake Okoboji, Iowa has a towering tourist attraction: the 63-foot Legend, on park grounds since 1930. The appeal, according to purists, is a bumpy ride akin to the spin cycle of a dryer. By 2013, the coaster was tossing passengers around so freely that it underwent renovations to make for a smoother ride. In August 2015, Des Moines-area retiree Les Menke took it for a spin: 85 years previously, the 96-year-old and a friend had been the first on board following a bunch of test sandbags. Roller coaster design legend John Miller crafted this Kennywood Park attraction, which debuted in 1924 as the Pippin and got patrons soaking wet thanks to a path that cuts through a ravine. When the ride got a redesign in 1968, a naming contest was held: Thunderbolt was the winning entry. It no longer gets riders soaked, unless you count the sweat of sheer terror: The climactic drop is 95 feet. 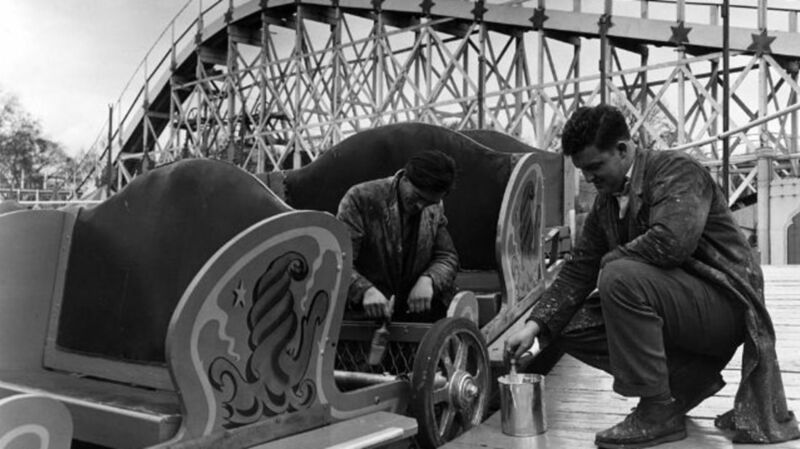 Bristol, Connecticut’s most famous human agitator is located at Lake Compounce and opened in 1927. It made major local headlines in 1975, when man of leisure Noel Aube hopped on and rode it 2001 consecutive times, logging more than 79 hours on the coaster. Aube would eat and sleep on the track; business of a personal nature could be handled during the five-minute breaks he’d take every hour. While you usually need to be of a certain height to hop on amusement rides, the 1928 Kiddie Coaster is one of the few to penalize visitors for being too tall. Running for just 300 feet, the Playland Park attraction (Rye, New York) is intended for children only. Opening in 1902, Altoona, Pennsylvania’s Leap the Dips is the world’s oldest surviving roller coaster. It might also be the most tame: topping out at 10-18 mph, the drops are a fairly serene nine feet. But being on board is another story: passengers experience an undulating series of dips that feels like being in a car without shocks. If you need a relaxed introduction to roller coasters, this is probably the ride you've been looking for.